AMERICA! SPREAD YOUR GOLDEN WINGS! SAIL ON FREEDOM'S WIND 'CROSS THE SKYYYYYYY-Y-Y-Y-Y-Y! All of which is to say: on Monday I went to Jefferson's estate Monticello and I took the Behind the Scenes tour! Weirdly enough, no audio-animatronics were involved. Under normal circumstances, no photography is allowed inside the Monticello house as some items are on loan. My understanding is that the standard tour goes through the first floor only - but for an additional fee, we were taken to the second and third floors as well. On the third floor, there are a few explicit places we were allowed to take pictures; specifically, the octagonal room and the "cuddy," a connected little space Jefferson's granddaughters like to play. Along the way, our guide gave us insight as why each room had been designed - or decorated - or "interpreted" (when the decorators were basically deducing and extrapolating) - in its fashion. Highlights included the day-of-the-week weights with a hole in the floor for Saturday and an interpreted grandsons' room where you could touch everything. I didn't care for the tour guide's fairytale approach to stating the facts, but she was very nice and quite cheerful about questions. By contrast, the guy who did the slave quarters tour was matter-of-fact and unbiased. He walked us along Mulberry Row where the cabins were, along with other buildings like the smithy and joinery. He talked a lot about how Jefferson sought to improve slave conditions but tempered it with less rosy discussion of the realities of ownership. Per the tour, Jefferson considered slavery a double-edged sword; supposedly he freed few of his slaves because he felt it cruel to release people who did not have a trade with which to support themselves (and, as the guide himself said, you may make of that rationalization what you will). And while Jefferson almost never sold a slave, he was known to give them away. Generally to people that he knew and/or was related to that could be trusted to care for them well, but it was still a separation of families that was greatly feared among slave populations. 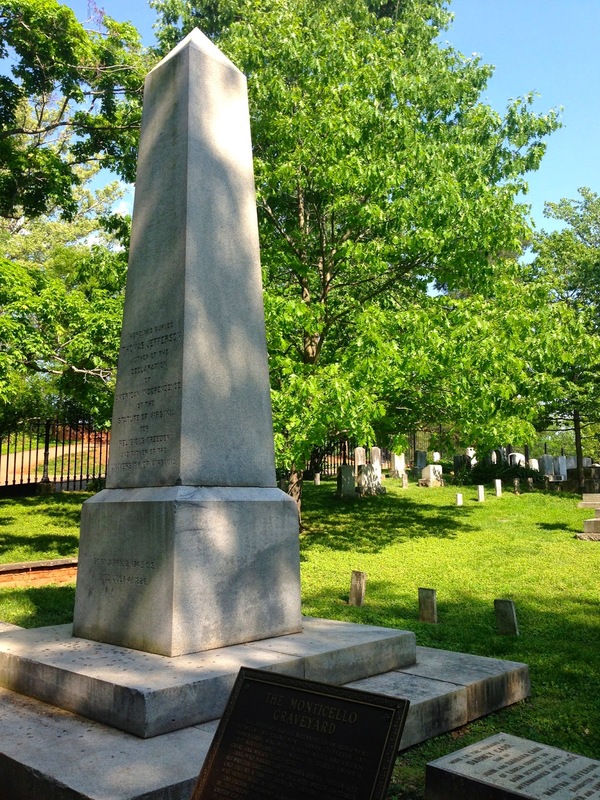 Jefferson is buried in the graveyard at Monticello near the house, which remains privately owned by Jefferson's descendants. You can visit the grave and reference the handy map of the buried, but you can't enter. We also toured the museum in the visitor's center, which was filled with artifacts from Jefferson's life. My personal favorite was the sliver of Shakespeare's chair Jefferson had cut off during his visit to Stratford-upon-Avon. There is a movie about the construction of Monticello in the visitor's center, but we didn't have time to take that in. Other things we missed: we didn't give the Crossroads (under the house) a thorough perusal, nor did we take the garden tour, which is supposedly more about Jefferson's gardening philosophies than the contents of the garden itself; we also didn't check out the archaeological dig. So much to do, so little time! We did visit the gift shop, which in addition to the expected t-shirts and mugs had some cute items with a historical flair; I bought Elizabeth some scone mix for her birthday (and I hope she doesn't read this before I give it to her. If she does: you'll never guess the flavor, Elisabet!). In short, if you have an interest in American history, I would very much recommend a visit to Monticello. Jefferson was of course a consummate Renaissance man, and there is much to interest just about anyone who enjoys The American Adventure at Epcot. And who doesn't? I will leave you with the song that played on loop in my head at Monticello. Now then, sir: will you be a patriot, or a lover?